Throwback Thursday! This is perfect timing: BERRY SEASON IS FAST APPROACHING! I’ve been stocking up on all sorts of sale items this week at the grocery: cheap strawberries and cheap avocados! My guacamole consumption at the moment is obscene. In a wonderful way. AS IS MY STRAWBERRY SWIRL POUNDCAKE INTAKE! Oh man. I actually need help — anyone in PDX want some pound cake? I have most of this one in the freezer now, to prevent me from eating all of it in one sitting! Oof. Have you guys heard that new(ish) Mariah Carey song, Beautiful? Decently catchy, kinda; however, WHAT THE HELL IS SHE THINKING!? The first time I heard her say “I love [it] when you run red lights” I thought, “She couldn’t have really said that, right? That’d be crazy.” No, she says that. Girl: did your mama never teach you about SAFETY? Running red lights (especially whilst on the back of a motorcycle) just doesn’t sound safe, nor smart, nor even FUN to me. Yikes. Am I crazy? I’ll take my law-abiding safety-conscious self over a flattened pavement decoration any day. It’s seriously distracting to listen to the song, because I just can’t help but lecture her in my head! 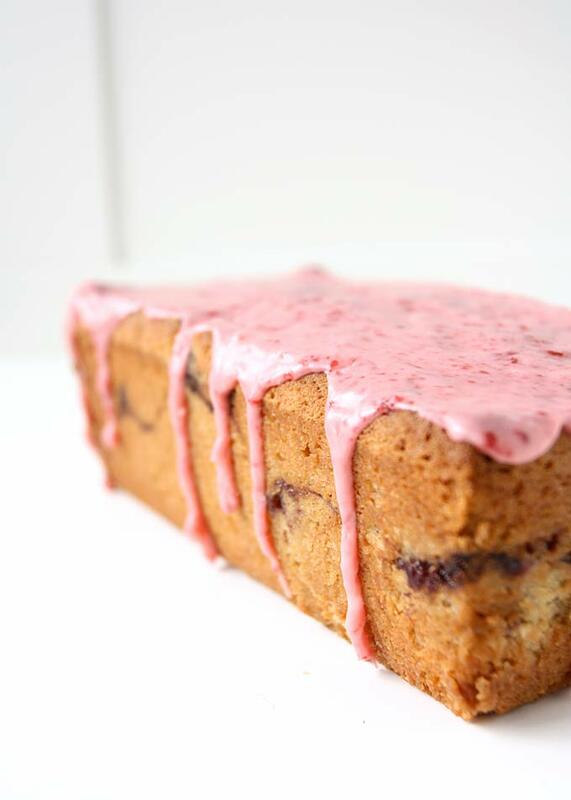 Onto other smart choices: strawberry swirl pound cake! OH YES. This stuff is pretty darn addicting, especially with the strawberry glaze — the flavor is pretty intense strawberry. The recipe makes two large loaves — I should admit that these pictures are of only 1/2 recipe. I’m a big fan of sour cream pound cakes, so that’s what I did for this one! It is SO moist! Preheat the oven to 325 F and prepare two 8″ loaf pans with butter and flour. In a stand mixer with the paddle attachment, beat the butter and sugar together until light and fluffy. Add the vanilla and sour cream. Mix until smooth. 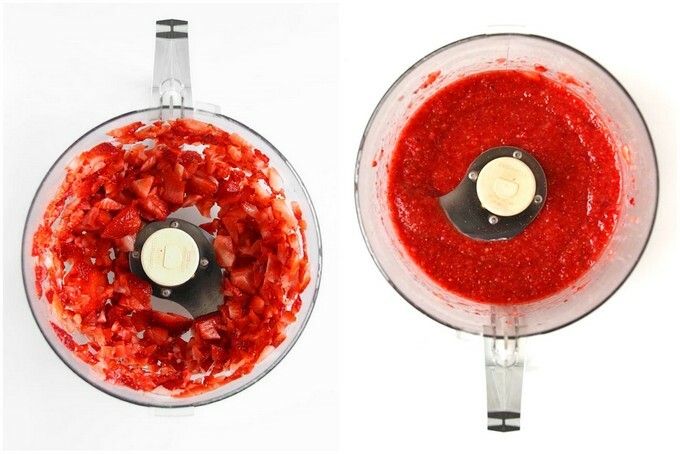 With a hand blender, puree the strawberries until smooth. Add the brown sugar. Set 1/4 cup of the pureed strawberries aside for later. Fill each loaf pan halfway up with cake batter, then pour about 1/3 cup (half of remaining for each pan) of strawberry puree on top. Pour the rest of the batter on top of the strawberries, and use a butter knife to swirl everything together. Bake for 65-70 minutes, or until a cake tester comes out clean. You may need to tent with foil to avoid too much browning. Let cool before mixing the remaining strawberry puree with the powdered sugar and pouring over the loaves. You always post the prettiest pictures and make me crave it all! This is no exception, lovely and delicious! I have just subscribed to your blog!!! 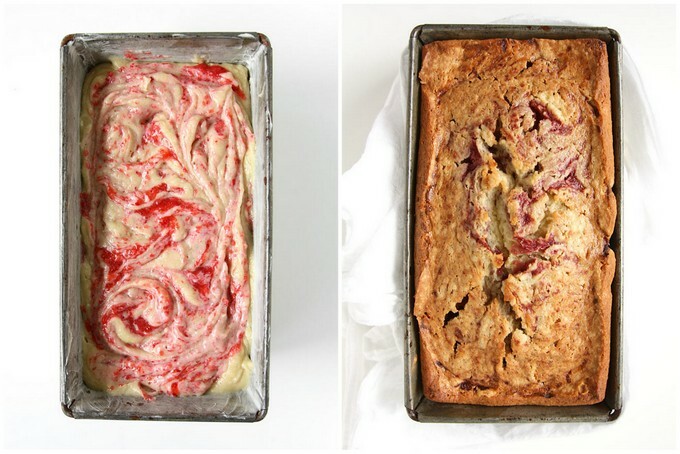 Today I am baking the strawberry swirl pound cake but I have a serious question to ask. Can I freeze one of them because I didn’t know that “twins” were coming out, so please a little help. I am at the baking phase rigth now so still cant have an opinion about the taste. But from the pictures you have posted it looks DELICIOUS. I cant wait for my afternoon coffee!!!! Thank you very much in advance, for your lovely recipes. Hi Eva! You can definitely freeze these! I like to wrap them in plastic wrap followed by foil. Enjoy! When you mean 2 cups strawberries for the pound cake, do you mean 2 cups whole strawberries or sliced? can you make these into cupcakes/muffins? what would be the baking time? Sure! I’d start at 15 minutes and check on them frequently until they’re done! So I just made this and it was delish! I only used 3 eggs and 2 cups of flour (made a smaller portion) but kept pretty much everything else the same. The only thing is it’s a bit dry, but next time I’ll add some mayo which apparently makes cakes more moist. Great recipe nonetheless! I didn’t know the measurement for the strawberries in the recipe was for whole until I read the comments. I am ,,making them now , I hope they turn out alright. Hi! First time reader here! This recipe looks so delicious, but I’m nervous because the last time I tried to bake a cake from scratch it also called for 6 eggs and I couldn’t for the life of me get it to cook all the way through, seriously! It was burning on the edges but the center wasn’t cooked at all. Have you ever encountered that? And how would you avoid it if you did??? Thank you for this recipe. I found it on pinterest. Its delicious and moist! I gave slices to a bunch of people to try and everyone loved it! Will be making this again! Thanks, Emily!! Glad you all enjoyed it! 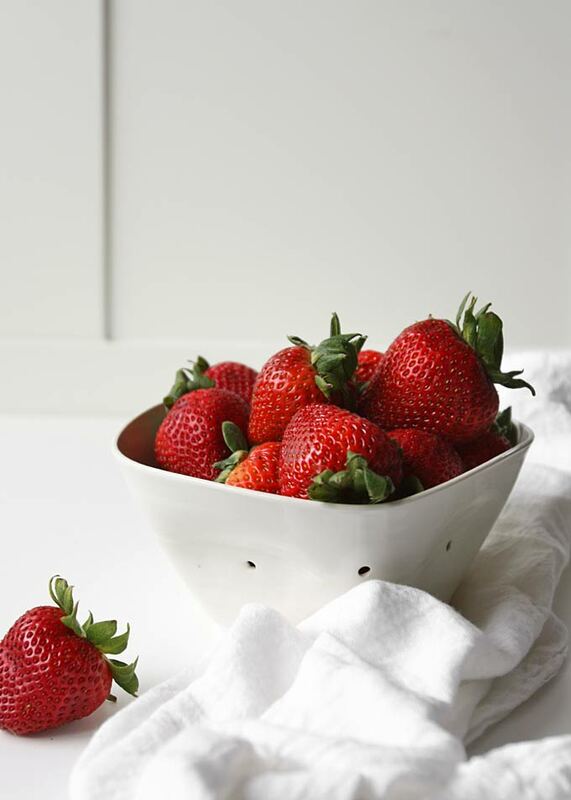 Probably a stupid question, but what is the purpose of taking out the ¼ cup of pureed strawberries? If I’m reading the recipe correctly you take ⅓ of cup of strawberries per loaf in between the layers of cake batter then the rest of the strawberries gets added to the powdered sugar for the icing??? If you were making this in a round bundt pan would you suggest 3/4 of the recipe? I think halving it wouldn’t be enough and keeping the regular recipe might be too much. Any ideas? Awesome thanks! I think it is a 10″. Cup of 250ml ???? What sour cream use?? I am from Romania. Hi Adrian! I’m not sure exactly how to help you… Sour cream meaning thick, slightly sour, yogurt-consistency topping! Or you can use thick plain yogurt. It should be about 240ml, I think! Good luck! I just made this this morning and the batter is delicious! I halved the recipe (perfect amount for a “mini” bundt pan). I greased and floured but my cake split in half where the puree was. I think I let the strawberries get too close to the edge of the pan and the fruit stuck. Per haps a loaf pan will be easier to keep the puree in the middle so sticking isn’t an issue. Still a delicious cake and I will definitely make again, with many other fruit combinations. 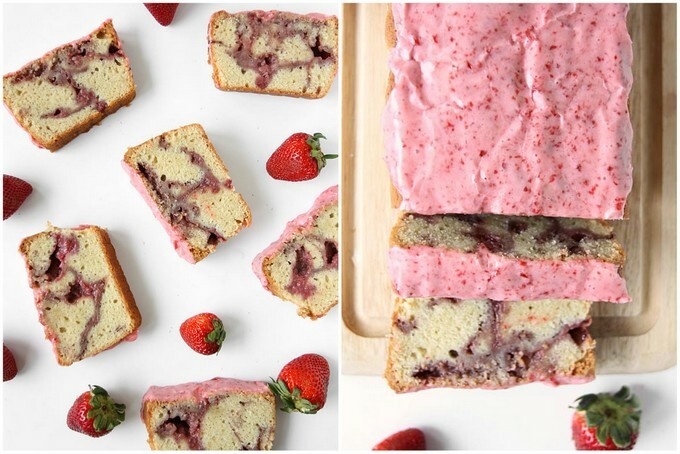 It’s not exactly strawberry season, but I would love to make this asap. Would you use frozen strawberries? Hello, I’m currently making this cake, but I put it in a Bundt pan. After 70 minutes it’s still not done. How much time do u recommend if this is made in a bundt pan? Thanks! Oh dear ! You made my day ! Thank you so much ! Hi! My icing was more of a jelly consistency, rather than the opaque pink you have in your pictures. Thoughts on how this may have happened? Thanks! Hi Tracey! Interesting… I’ve never encountered a jelly-consistency icing! The only thing I can think of is just that there might not have been enough liquid, but I can’t be sure! I hope it all tasted alright! Just trying this while it is still warm. Outstanding! The pound cake alone is the best I have ever had. 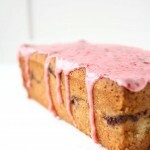 Next time, I think I will add more strawberry puree to swirl into the cake, only because I am a glutton! But truly, it’s incredibly tasty and this is even BEFORE I add the strawberry glaze. You are my new guru! Thanks! What do you think about doing this in a bundt pan instead of two loaf pans? Does the glaze get hard? Can I freeze it after it’s glazed? Hi Eddie! The glaze does harden as it dries. I would NOT recommend freezing it after it’s glazed — I’d glaze it after defrosting. Has this recipe been adjusted to high altitude?